This volume examines the notions of grammar, rule, and derivation with reference to the Astadhyayi as a grammatical device. An attempt has been made to clearly outline and illustrate the basic constructs of the Paninian linguistic theory especially as they relate to the traditional views on the one hand and modern linguistic orientations on the other. A developmental history of the Paninian school focusing on major texts and trend along with a detailed treatment of rule-types, paribhasas, and samasas, complement the discussion of derivational mechanism and related conventions. This book is reprint edition of Vol. I, with a translation of rules in the Index and an updated bibliography. In the meantime five volumes have already been published and the concluding volume six will be published soon. Vols. 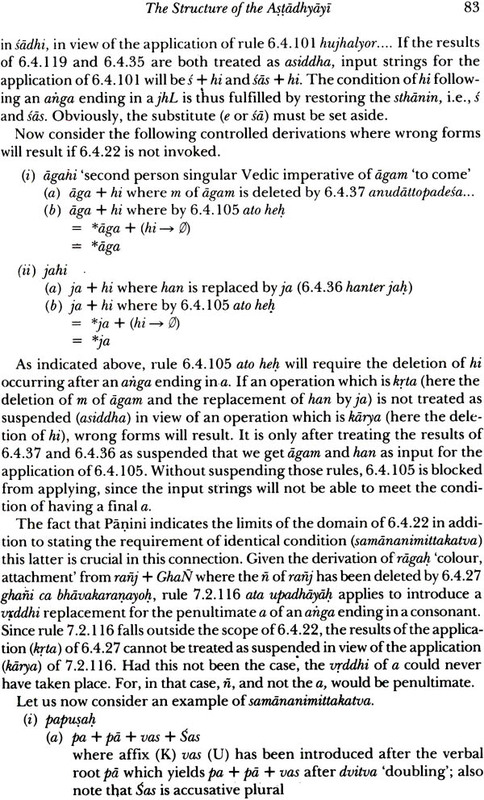 II-VI contain the text of the Astadhyayi with English translation, explanatory notes and complete derivational history of all forms cited as examples by the Kasikavrtti. Rama Nath Sharma is Professor of Sanskrit at the University of Hawaii at Manoa, Honolulu, Hawaii, USA. He received his Ph.D. (1971) in General Linguistics from the University of Rochester where he also taught Linguistics for five years. His research interest includes grammatical theory in general, and Panini and the Indian grammatical tradition, in particular. This book is a development of one basic assumption: that the Astadhyayi of Panini is a grammatical device which consists of a limited number of ordered rules capable of deriving an infinite number of correct Sanskrit sentences. This, essentially, is the assumption that modern linguists make about grammatical devices. However, the Paninian device is in many ways unique. I have tried to present the basic mechanisms of this device by focusing upon how they actually operate in the derivation process. Since there is considerable literature dealing with the nature, language and principles of the astadhyayi, and also since a comprehensive treatment of them is soon to be completed by George Cardona, I have strived to ref- rain from duplication. As already stated, my approach is different. How- ever, certain topics had to be included, the discussion about karakas in chapter 9, for example. Chapters 1 and 2 are provided by way of background. The remaining chapters, in one way or another, comple- ment or illustrate my basic hypothesis. Chapter 7 presents a listing of the Paninian definitions and interpretations. Such a listing is provided for quick reference. 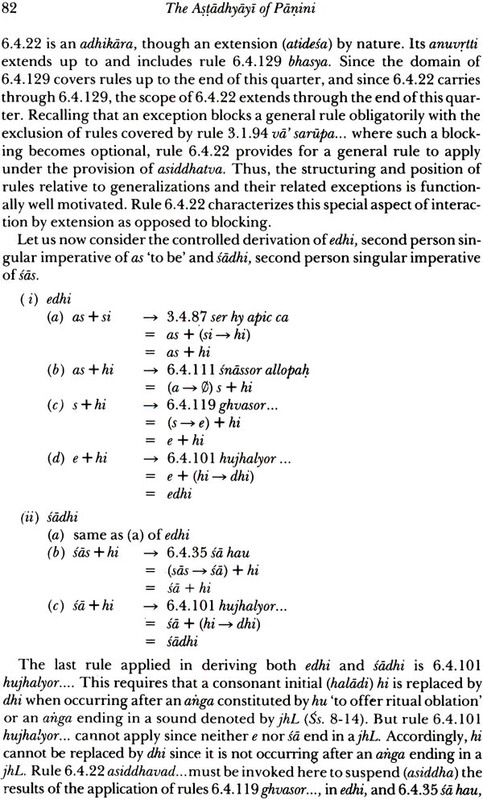 Chapter 8 presents some additional interpretive rules, which, although not explicitly stated in the Astadhyayi are essential for properly comprehending its derivational mechanism. These interpretive rules have been selected from the Paribhasendusekhara of Nagesa based upon their importance for my study. This chapter is also essentially a reference chapter. Chapter 11 presents a detailed description of Sanskrit compounds which is designed to show how my proposals are fully applic- able to an important derivational type. My orientation towards Panini is basically linguistic, in the sense that I try to look at the Astadhyayi in view of questions which are often asked in modern linguistics, especially in the area of formulation, interpretation, order and application of rules. However, since I have relied heavily upon the traditional interpretations, instances accepting the traditional rather than the contemporary view are numerous. My rather critical attitude towards certain recent writings should not be looked upon as an effort on my part to diminish their importance; my motive in all cases has been to put them in proper perspective. There are features in Panini which one may be tempted to identify with features outside Panini. My position on such identification is that Panini is what Panini is. Any attempt to interpret the Astadhyayi in the light of some particular contemporary linguistic theory risks compromising Panini. Finally, it should be understood that my ideas, though I have tried to present them clearly, are not the final word. There is still a great deal of work to be done. For example, the deri- vational conventions which I propose, need further refinement. I am honoured to have had the opportunity of studying extensive pas- sages from the traditional texts with my father, Pandit Raghunath Sharma. Pandit Ramaprasad Tripathi, and my younger brother Narendra -both of the Sanskrit University, Varanasi - were most helpful in bring- ing certain of my ideas into better focus. I am indebted to Professor O.L. Chavarria-Aguilar for leading me into Paninian studies. I will be failing in my duties if I did not mention that I have benefited, above all, from the writings, which include unpublished manuscripts and personal communi- cations, of Professor George Cardona of the University of Pennsylvania. Cardona has constantly served as an important source of reference and insight. Of course, I take full responsibility for any errors I may have made in this book. Thanks are also due to the University of Hawaii, its Research Council and the Department of Indo-Pacific Languages, especially to its chairman, D. Haigh Roop, for facilitating my research through grants and sabbatical leave. The American Institute of Indian Studies has been very supportive of my research endeavours on Panini. I am grateful for their grant under which I finished the writing of this volume. This book is being published as volume one of a projected five-volume study. Subsequent volumes will include the text of the Astadhyayi with English translation, explanatory notes and complete derivational history of all forms cited as examples by the Kasikavrtti. Finally, I must thank Stan- ley Schab, my research assistant, for not only editing and typing the man- uscript but also for making some very valuable comments. skhalitam api sambhaven nas tatra vibudha vimatsarah saranam. I am happy to see this reprint edition of volume one, TheAstadhyayi of Panini, Introduction to the Astadhyayi as a Grammatical Device. I had promised to prepare an enlarged edition of this study with additional details on scan- ning conventions and traffic rules but, mostly due to preparation of other volumes, I could not keep this promise. I do not think it will be possible for me to go back to it in the near future. There are still many other projects which I must complete. But since my presentation of derivational system still makes sense, and also since it could still be used to the benefit of under- standing of Paninian system of derivation, I am in favor of bringing this reprint edition. Panini has become very popular in contemporary linguistics, computation and artificial intelligence. The Director of a German institute where they are working on computer application of Panini, considers this volume the best available in the market. I have updated the bibliography and have added translations of rules in the index. I hope my readers will find this addition useful. I would like to thank Christopher Bopp for preparing the index. Mr. Devendra Jain, Director of Munshiram Manoharlal Publishers, gets most credit for bringing out this reprint edition at such a short notice. I shall appreciate it very much if my readers write to me about the contents of this volume.